The following information applies to employees on the Outlook Web App as part of Exchange 2016. 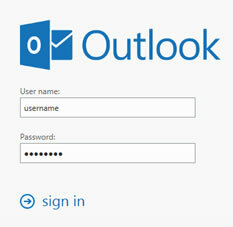 There are two ways to login to Outlook Web App. First, via direct login, please go to https://owa.vcccd.edu/ and then login with your MyVCCCD credentials. Second, via MyVCCCD portal, login to MyVCCCD. 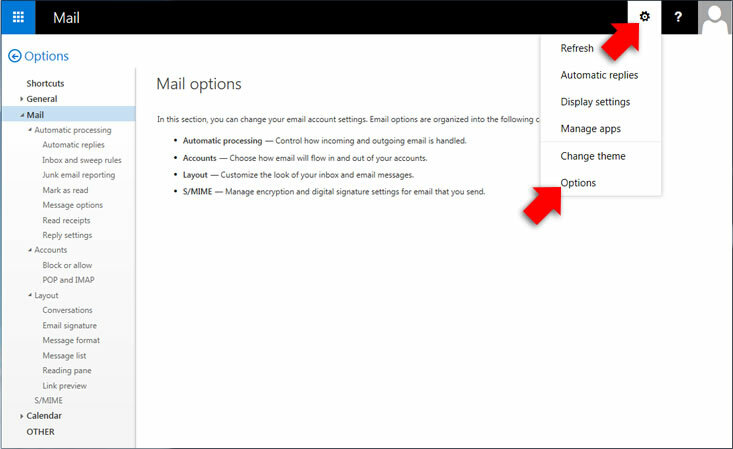 Then click on Outlook Webmail icon. You will be redirected to https://owa.vcccd.edu/ where you will login with MyVCCCD credentials a second time. 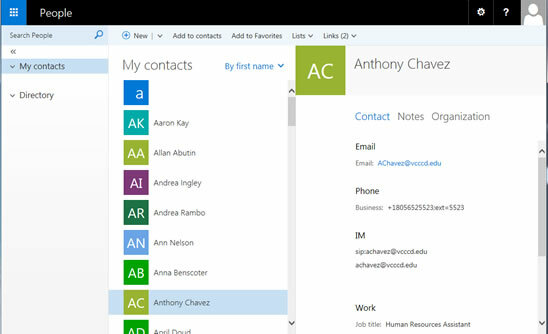 To switch between email, calendar and contacts, click on the icon at top-left. 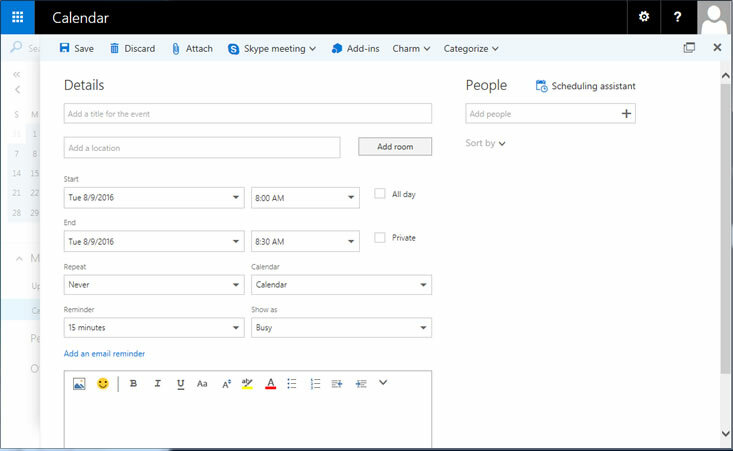 This opens a window where options Mail, Calendar, People (contacts) and Tasks may be selected. In the Mail view, folders are on the left, list of messages in the middle and preview pane on the right. The folders are on the left side of the interface. 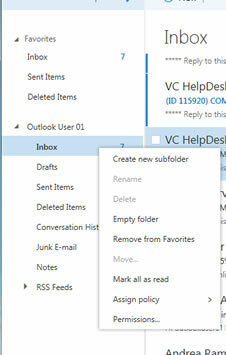 To create new folders, right-click with the mouse and select "Create new subfolder" in the menu that appears. Additional features are available in the same menu as creating new folders. By default, messages will be grouped by Conversations (or essentially by the subject field of messages). To change this to more traditional view where every message is not grouped, click on All then Messages. This setting is per folder. 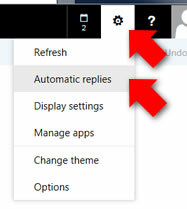 Click the New button above the Inbox. For recipients, click on "To:" text to look up by address book or type recipient names. For additional features, click the three dots to the right for a drop-down. 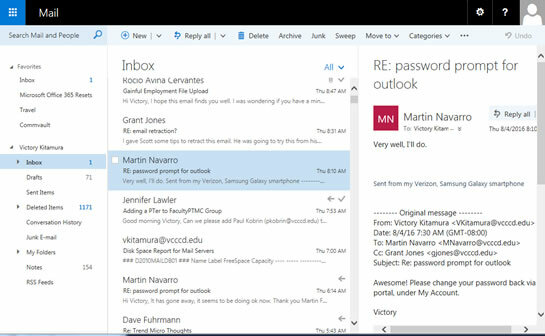 Click in the Search Mail and People box, begin typing search terms and click Enter to search. Click the icon at top-left and choose Calendar. In Calendar view, click New to start a new calendar entry. To adjust calendar view, click one the words "Day, Work week, Week, Month, Today" on the right accordingly. 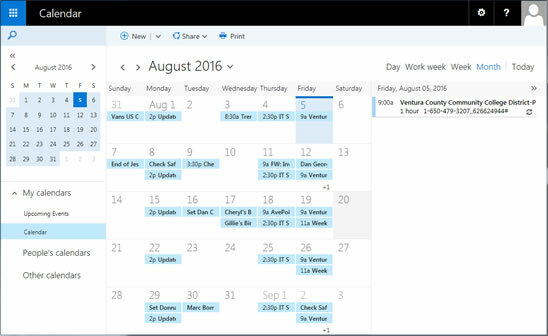 Fill in the fields for the new calendar entry and Save to finish. For VCCCD employees with Lync or Skype for Business enabled, click on "Skype meeting" to voice/video conferencing features for the meeting. Click the icon at top-left and choose People. Folders of contacts are on the left. Contacts or in the middle. Details of a selected contact are on the right. To add a contact, click New. 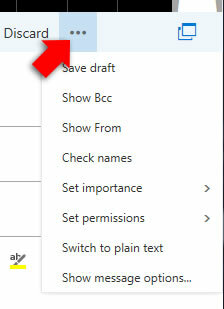 To view additional options for Outlook Web App, click the grommet or gear icon and click Options.